I’m always surprised when somebody asks me about fiber on a low-carb high-fat diet. It seems to me that people who think they won’t get enough fiber when eating low-carb are confused about what it means to follow this kind of diet. Although it’s true that there is a lot of meat on this diet, it hardly forms the bulk of every meal, and meat is certainly not a replacement for vegetables. If anything, I eat more vegetables now than I ever did before I started following a low-carb high-fat plan. 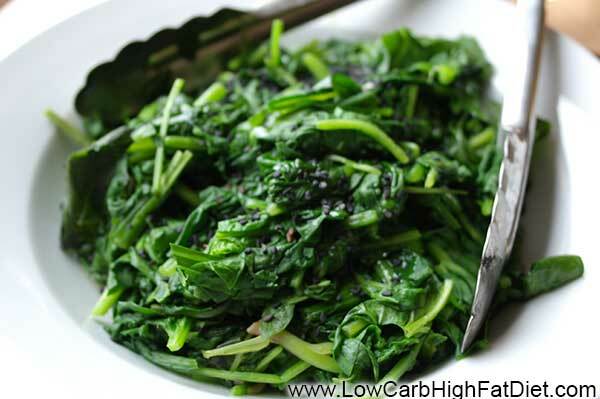 The types of vegetables you eat on a low-carb high-fat diet are typically very high in fiber. Avoid the mushy and starchy root vegetables, and emphasize leafy green vegetables that grow above the ground. There’s such a wide variety of vegetables it’s hard to pick a favorite, but I always have spinach, broccoli, lettuce, celery, and tomatoes on hand. Frozen mixed vegetables are also great to have available for quick and easy meals. It’s much better to eat whole vegetables than to juice. Juicing passes along only the sweetest and most simple carbohydrates. The seeds, skin, and pulp provide a lot of extra fiber. Also, although vegetables are technically all carbohydrates, the fiber they contain makes up a large portion of the carbohydrates that you get when eating a vegetable. Since the body can’t process fiber, that part doesn’t count as a carbohydrate in your diet. Some experts emphasize the importance of eating raw or undercooked vegetables in order to maximize the vitamin content. I’ve found that there are number vegetables that don’t agree with me unless they are cooked. Some examples are the crucifers, such as broccoli, cabbage, and brussels sprouts. If you find your body reacting badly to raw vegetables, don’t give up. Try sautéing, boiling, or microwaving them for a minute or two with a little bit of butter or oil and see if you don’t respond better to them. I also take fiber supplements. I’ve been doing this since long before I started eating low-carb high-fat. My body is used to having this particular type of fiber on a regular basis. I understand that it’s good for intestinal health to have a variety of fiber sources available. The fiber passes through your system unaltered, and by the time it gets to the gut, it can be processed all the microorganisms that lives down there. According to probiotic researchers, the flora and fauna living in your intestines are happiest when they have different sources to chew on. When I supplement my fiber, I typically use a psyllium husk source, although there are alternatives such as Chia seed and hemp seed. The most popular brand of psyllium fiber is Metamucil. It isn’t expensive even if you take it on a daily basis, but the generic alternatives to Metamucil work just fine as well. They all function just about the same. I take two doses today, one in the morning right after I get up, the second right before going to bed. Each time I take a fiber supplement, I drink about 16 ounces of water with it. The first cup washes down the fiber, and the second cup washes out my mouth. It’s important to drink it with cold water, and drink it quickly after mixing, or it can get thick and hard to swallow. Fiber supplements are a great excuse to drink more water. Getting enough water into your diet is one thing that I think is universal across every eating program I’ve ever seen. There is no substitute for water. It makes up most of the body, and without enough water, your system doesn’t have what it needs to process the foods you’re eating so you can be healthy. Any excuse to drink water over the course of the day is a good one. I notice the different brands of fiber have slightly different flavors. I usually take the sugar-free orange-flavored varieties, although unflavored psyllium has a surprisingly mild taste you can actually be quite pleasant. If you’re buying a brand-name, or even many of the generics, you may find it difficult to locate unflavored ground psyllium husks without any artificial sweeteners in them. I’ve mentioned before that I don’t have a problem with artificial sweeteners, but I understand many of you might. if that’s the case, it’s not difficult to find unflavored and unsweetened psyllium husks in bulk at natural food stores, or even online. Psyllium can also be used as a bulk agent in cooking. If you’ve tried my recipe for low-carb high-fat sliced bread, I usually recommend using ground flaxseed to give it a little bit of body. Ground psyllium husks can also be used. Of course, in this case, I recommend using the unflavored kind. So don’t worry about getting enough fiber on a low-carb high-fat diet. The vegetables you eat as the main portion of most of your meals should be more than enough for most of your needs. If you want to supplement your diet with fiber, there are excellent sugar-free sources available that won’t interfere with your low-carb high-fat lifestyle.